The TR6 is essentially similar to the TR5 with styling changes by Karmann of West Germany limited to the front and the back of the car, extending from the wheel arches. 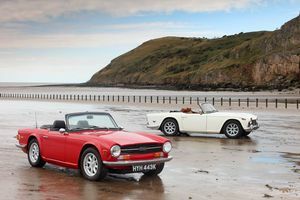 Mechanically, it is in most respects (apart from detail specification changes) identical to the TR5 and is the last of the separate-chassis TR's. North American specification cars had two Stromberg carburettors with extensive emission kit fitted in an attempt to satisfy local laws, whilst the rest of the world enjoyed Lucas Fuel Injection. The later 1973 model featured revised switches and dials, and a slightly different specification engine. Power was classified differently on these later models using the DIN power rating rather than the earlier SAE system. This resulted in the 1973 model appearing on the face of it less powerful. In reality it was only slightly less powerful than the earlier version. Early TR6 up to 1973 were fitted with optional A-Type overdrive. From 1973 onwards cars were fitted with J-Type overdrives.